Sutures have a long and bizarre history, dating back to ancient Egypt, where everything from tree bark to hair was used to stitch human flesh back together again. Physicians have used suture to close wounds for at least 4,000 years. Archaeological records from ancient Egypt show that Egyptians used linen and animal sinew to close wounds. In ancient India, physicians used the pincers of beetles or ants to staple wounds shut. They then cut the insects’ bodies off, leaving their jaws (staples) in place. Other natural materials used to close wounds include flax, hair, grass, cotton, silk, pig bristles, and animal gut. The fundamental principles of wound closure have changed little over 4,000 years. 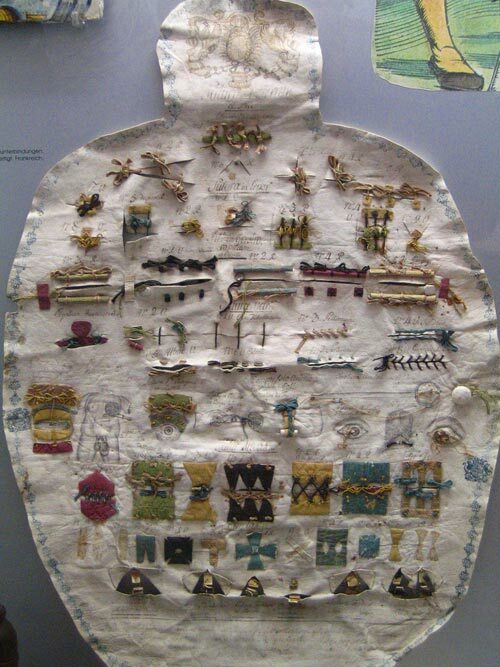 Below is an amazing surgical suture sampler, circa 18th century, from the Zurich Medical History Museum in Switzerland. 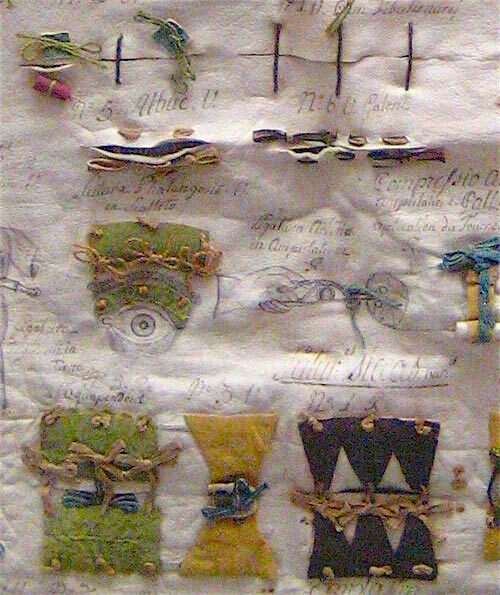 In the closeup image, note the variety of stitch techniques and detail, all appropriate for different anatomical regions and types of injury. Another of the many contributions by the great 16th century French surgeon Ambroise Pare was his use of the ligature for the control of bleeding. To the right is one of many illustrations of Pare’s techniques, this from Illustrated Manuel of Operative Surgery by Bernard & Huette (1855). Below is an 1893 extant sample of catgut sutures in several sizes. Catgut was one of several animal materials used as suture thread through the nineteenth century. How happy I am to have been borne after local anaesthetic was invented. This must have been torture to endure.